To follow up on our previous post: Here’s the skinny on Nissan’s new EV, a four-door hatchback called the Leaf that boasts a 100-mile range on a full charge, charges to 80% in 30 minutes, and exceeds 90mph. Nissan’s biz model is a smart ecosystem approach: partnering with battery-charging network entrepreneurs (Better Place) and green government initiatives. 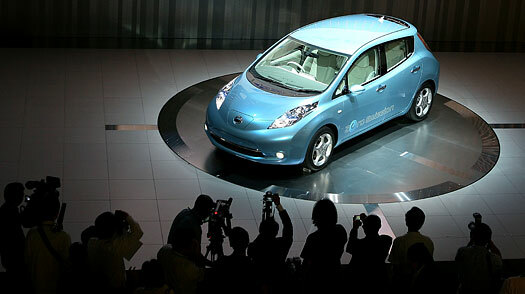 Nissan’s planning to unveil its new zero-emissions electric vehicle at its HQ on Aug. 2. Check out the performance stats overview on its site. The car is counting down to lift-off in 2010. Nissan has been addressing a wide range of actions under “Blue Citizenship” which represents the company’s desire to protect the blue planet and to be a corporate citizen that can live symbiotically with people and society. These efforts range from such global issues as the environmental protection to contribution to communities, promoting diversity and making personal mobility available to as many people as possible. 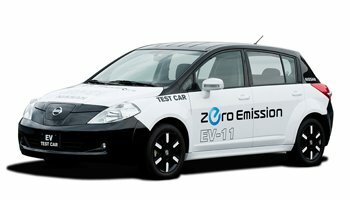 Nissan continues promoting the development of zero-emission vehicles based on the “Blue Citizenship” spirit by introducing effective technologies, products and services into the market. You are currently browsing the archives for the zero emissions electric vehicle category.